A couple of weekends ago, my friend Honor and her family came down from Chattanooga to visit and be "tourists" in Birmingham for the weekend. Honor lived here for several years in the early '90s (she and Lisa were my college roommates), and I love it when we're all able to get together. 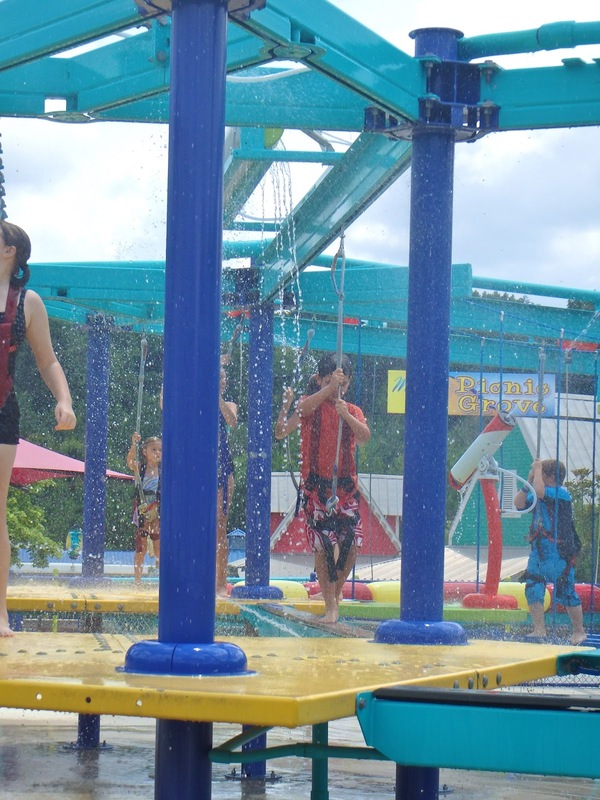 We got to Splash Adventure when the doors opened on Saturday morning. It was tough convincing the kids to let me get a couple of pictures before they headed off for parts unknown, but we managed it. Four are ours (of course), three are Honor and Doug's, and two are Mike and Lisa's. I don't know how you guys do it, but the only way I can keep up with my boys on the beach, at the pool or around a waterpark is to put them in the brightest rashguards I can find every Summer. Then I just look for orange and count to three repeatedly all day. Orange, one, two, three ... orange, one, two, three. The boys were so torn between running off with their friends and staying behind with Amelia. Ultimately, Nick and Jake decided they couldn't leave Amelia yet, so they stayed with us while Nathaniel and Grayson went with the others to ride the slides. We tackled the Lazy River. 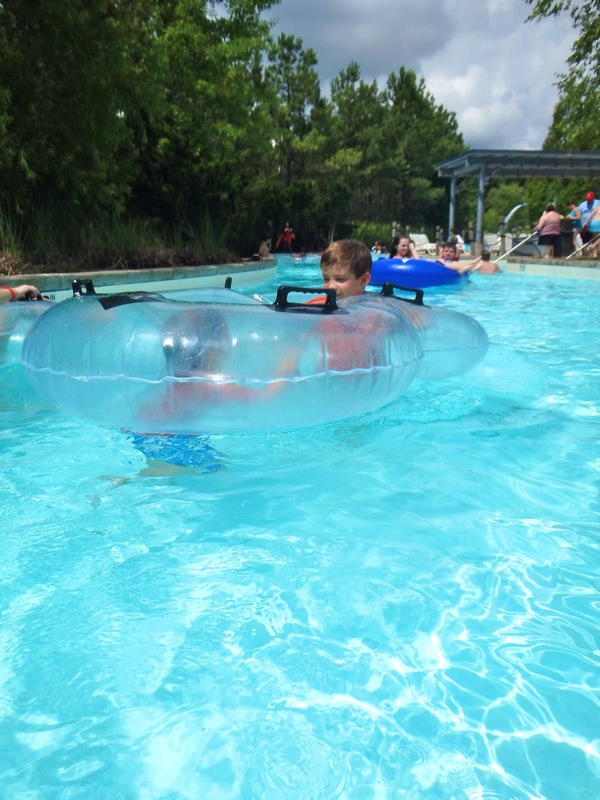 The nicest thing about being there when the gates open is that the attractions aren't too crowded until after lunch -- so we had plenty of room on the Lazy River. Amelia didn't want to ride on the tube with her brothers, so I carried her right behind them. We did the entire river at least five times, maybe six or seven ... and the boys swam, hopped on and off the tube, and entertained Amelia. Have I mentioned how much I love having my little underwater camera? Love it. Amelia finally got brave enough to at least hang onto the tube, but she never would agree to sit on it. After they got tired of the Lazy River, we went over to the Toddler Area. 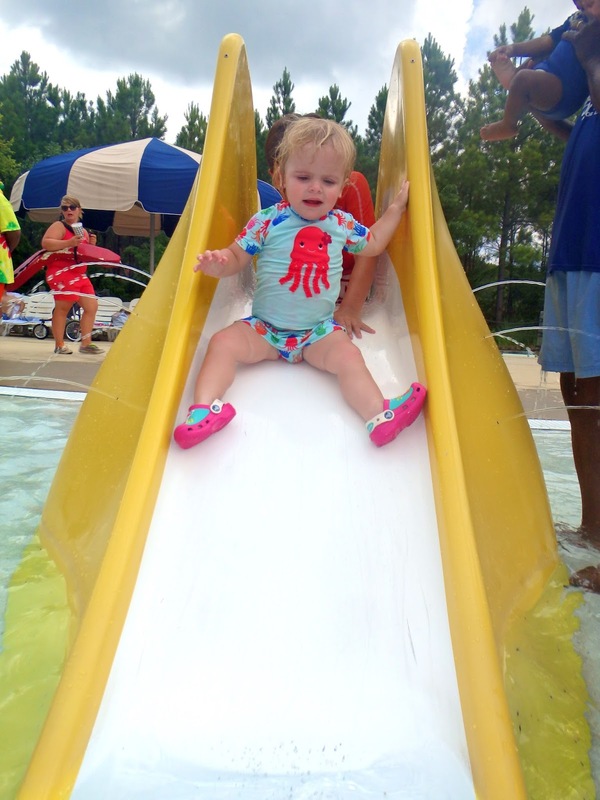 They have slides that are just the right size for Amelia, and the pool is only about 18 inches deep. Also, by this time Nathaniel was missing her so much that he swapped out with Nick and Jake so that he could have a turn playing with her. What's cuter than toddler thighs? Not much, Internet, not much. This makes it look like we were forcing her to do something she didn't want to do. Not true. 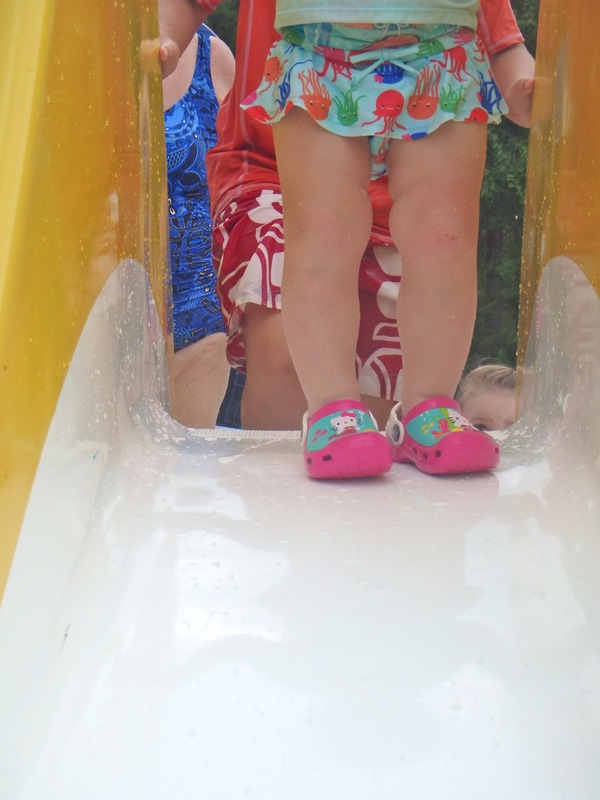 She was dying to go down the slide, but she couldn't figure out how to get down. So Nathaniel had to free her toes for her. 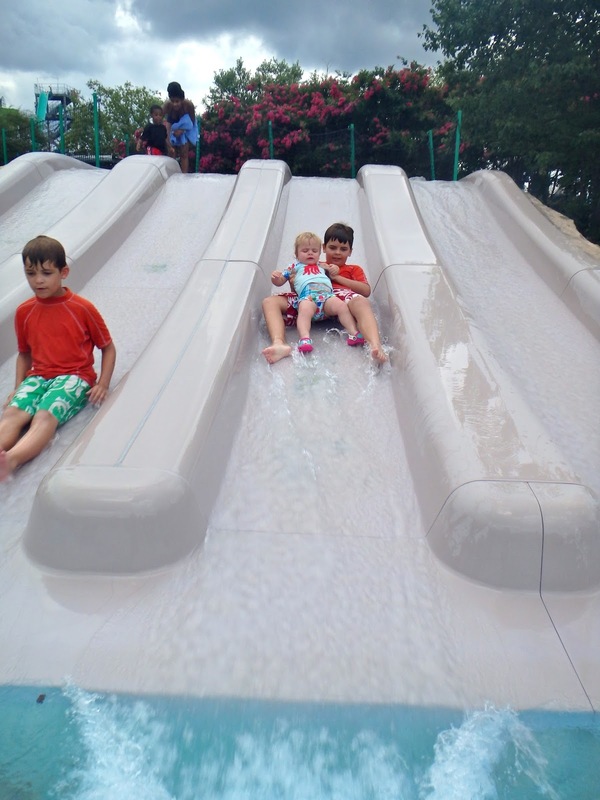 And then she said she wanted to do the bigger slide ... No, she REALLY DID! I promise. 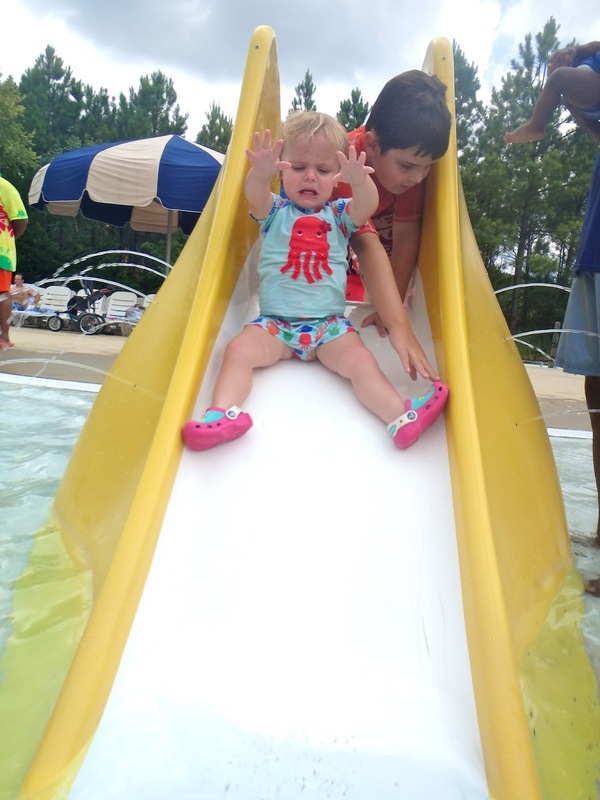 Even though the first trip down scared her, as soon as they got to the bottom, she squealed, "Again! Again!" And she did it about 15 more times. So there you go. New to the park this year is a course inspired by ABC's Wipeout. 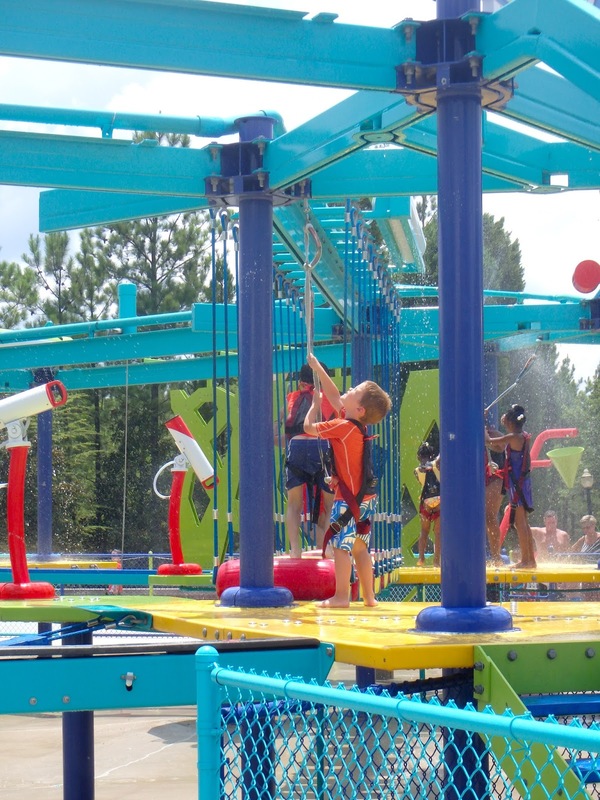 The kids each get harnessed in so they can't fall off, and then they navigate through a course while being sprayed with water hoses and thrown off balance by various other elements. We all thought it would have been MUCH more fun if it had been built over a big pool, more like the real Wipeout. Right? I know, I know, liability, blah blah blah. The kids had a great time on it anyway, even Jake -- which surprised me, because he really struggled with it. He wasn't quite tall enough to be able to yank on the rope and get it to cooperate with him easily, but he persevered! DJ moved through it like greased lightning ... he was quick! Hannah was really fast, too. My battery died while the kids were still on the Wipeout course, but after we finished up there, we did the zipline and got funnel cakes on our way out. We ended up staying for more than seven hours! Probably our personal record. 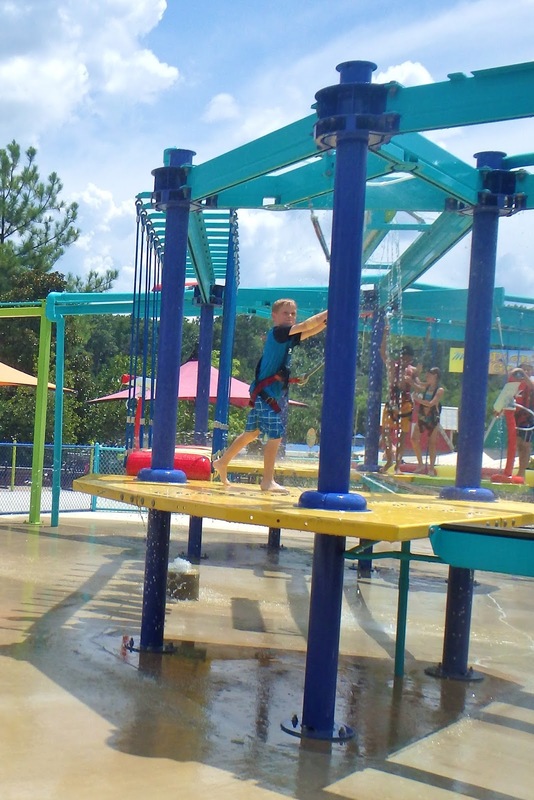 If you live within an hour or two of Birmingham/Bessemer, I highly recommend Splash Adventure for a day trip ... it's a lot of fun. And if you're local, the prices go WAY down at 4:00 ... almost to half-price and the park doesn't close until 8:00. Great way to beat the crowds! 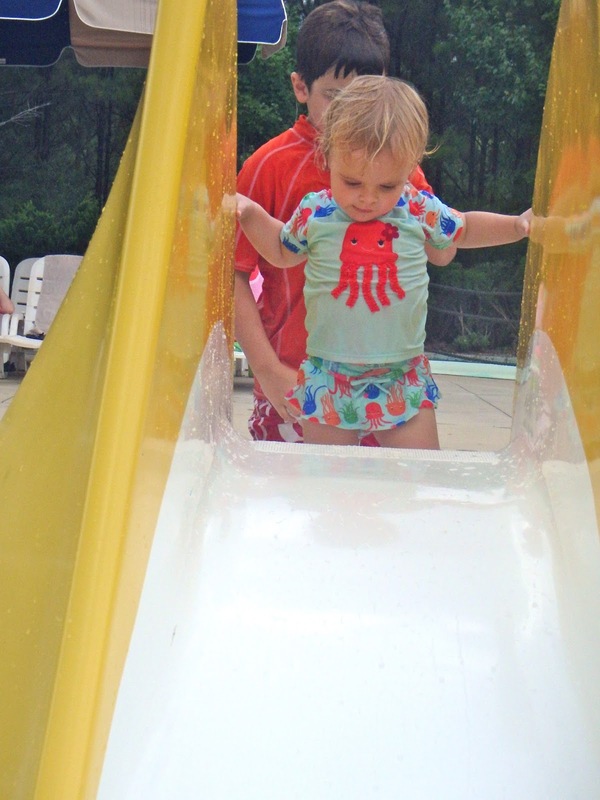 This is not a sponsored post ... We paid for our tickets to Splash Adventure.